Bible journal scrapbooking is a new technique that helps to further your growth in the Word. By adding pictures of your life to your Bible alongside scripture that reflects your life, you can see the relevance and practical application of the Word. Bible journal scrapbooking can be done anywhere and at any time. Typically, Bible journal scrapbooking is done in a Bible, but you can also use a journal, notepad, devotional, scrapbook, and you can even do it digitally through programs like Adobe Photoshop. We’re currently evaluating developing a Bible journal Scrapbooking course. We have other courses, free technique videos, and books on the list to develop, but we wouldn’t release this post without the option to let us know if you want something more. If you’re interested in learning more about scrapbooking in your Bible click here to sign up for the interest list. If there is enough interest, we may move this course to the top. Who knows? It’s really up to you. What is Bible Journal Scrapbooking? There’s nothing formal about Bible journal scrapbooking. There are no rules. There are no guidelines. There are no perfect pages. 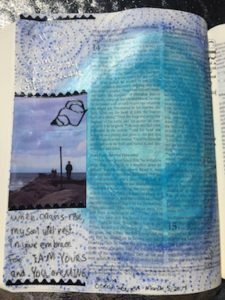 Instead, Bible journal scrapbooking is about responding to the Word creatively and seeing how the verses can and do apply to your daily life. 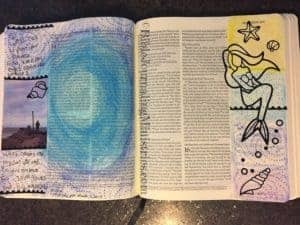 There are many different techniques and styles to use in Bible journal scrapbooking. The key is to keep embellishments thin if you want to close your Bible. My favorite way to do this is by painting or drawing my own backgrounds instead of using cardstock and using thin paper embellishments and stickers instead of bulky ones. You can use ANY photos in your Bible, so be encouraged and use what you have. We have found that the best photos for Bible journal scrapbooking are created on 2”x3” ZINK sticky-back printer paper using an instant camera or portable printer like the HP Sprocket Zink printer. This type of paper is thin (thin is so important when Bible journaling) and made for pictures, so you’re getting a picture that’s designed to last. The photo paper is thinner than the average photo, and the adhesive backing makes it easy to add pictures to your Bible when the moment strikes you. As an added bonus, the 2″ width is perfect for the margin of your Bible journal. Other options for thin photos in your Bible include printing photos on vellum, sticker paper, photo paper, as well as acid-free copy paper. These work just fine as well! The best printer for Bible journal scrapbooking is the portable HP Sprocket Zink printer because it’s instant and has the BEST app on the market. No need to wait for the film to come back from the printer shop! Just use the app on your phone, edit the picture, add words, frames, and graphics directly onto the picture and print them out. The best part is that unlike the instant cameras that use the same film, you don’t have to print every photo you take. Bible journal scrapbooking is simple. The most important part of your Bible journal scrapbooking time is the time spent in the Word. Find scripture topics in the front of your Bible or by searching online. If you’re scrapbooking pages of your children, search for topics related to children. Alternatively, you can use a Bible study or devotional to find scripture that you like and then take a photo during the day. Later, add it to your page. Determine what your focal point will be. This will create the flow of your Bible journal scrapbooking page. Often it’s a picture that eyes are directed to, but you can choose Scripture or ephemera as the focal point. Choose 1-4 pictures for one page depending on the type of Bible you’re using, the size of your pictures, and your personal taste. Lay out the photos want to display on one page at a time. Look at the photos for different colors that pop and elements that add definition to the photo. Decide if you’re using a matte behind the picture or if you’re using the photo by itself. Many Apps today can create beautiful photos that look like they’ve already been matted or have embellishments on them. Next determine if you’re using cardstock or if you’re creating the background with paint, gelatos, pencils, pens, or watercolor. If you’re using cardstock, you’ll be adding bulk to your page, but will also have many beautiful paper options to choose from. Simply match the photo with the color or pattern of cardstock you’d like to use. If you are not certain about the color, you should use you can always come back to it later. Add the photos to your page based on the layout that you determined in step 2. Add embellishments or other ephemera, like a page out of your church bulletin, tickets, notes, and cards. The thinner the better unless you want a chunky Bible journal scrapbook. That’s totally acceptable by the way. 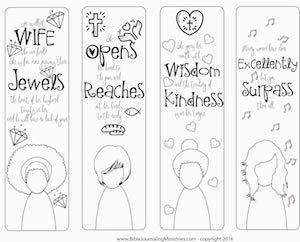 Add a special note, thought, or prayer in your own handwriting if you wish. You’ll be surprised at how often personalized writing is the one thing others love to read later down the line. Finally, add the photos and finish the page with beautiful embellishments. Remember to keep it simple and easy! Bible journal scrapbooking is a new technique in Bible journaling that ties life events to scripture and emphasizes application of the Word in your life. Scrapbooking the Word helps me connect my daily life with Scripture. I can often see the tie between application of scripture in my life by simply adding a photo of the day’s events next to a verse that I’m reflecting on. It’s another way I grow in the Word and closer to God every single day. If you’re interested in learning more about scrapbooking in your Bible click here to sign up for the interest list. Please share more about Bible Journaling and using scrapbook paper. I have a lot of scrapbook supplies and this is one way to use them up. Need to buy some stamp pads because all I have is pigment ink. One of your videos has been tampered with unless Tracy when doing scrap booking about her sons play drops the F bomb. Are you sure it’s my video? I’ve reviewed the scrapbook video of my son’s play and I don’t hear any f word except “focal point”. Thanks so much for your comment. I appreciate it!